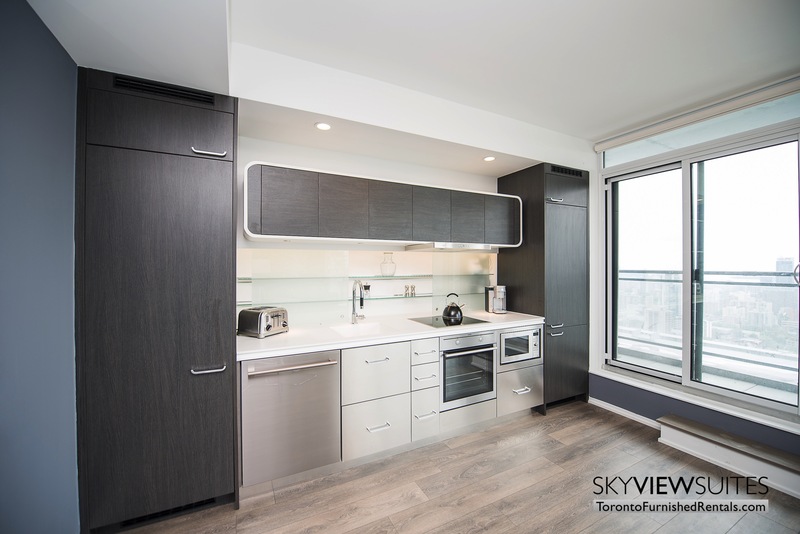 Welcome to the new age of living in this ultra-modern Toronto furnished apartment. 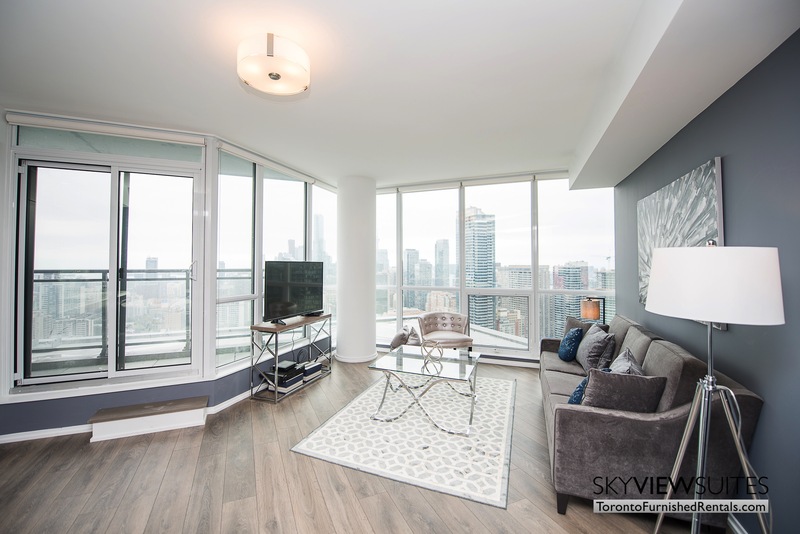 Nine foot ceilings, modern finishes and imported wide planked engineered flooring throughout the main living areas are some of the features to mention in this furnished apartment for rent. Food lovers look no further than this chef-designed kitchen for the creation of culinary masterpieces. 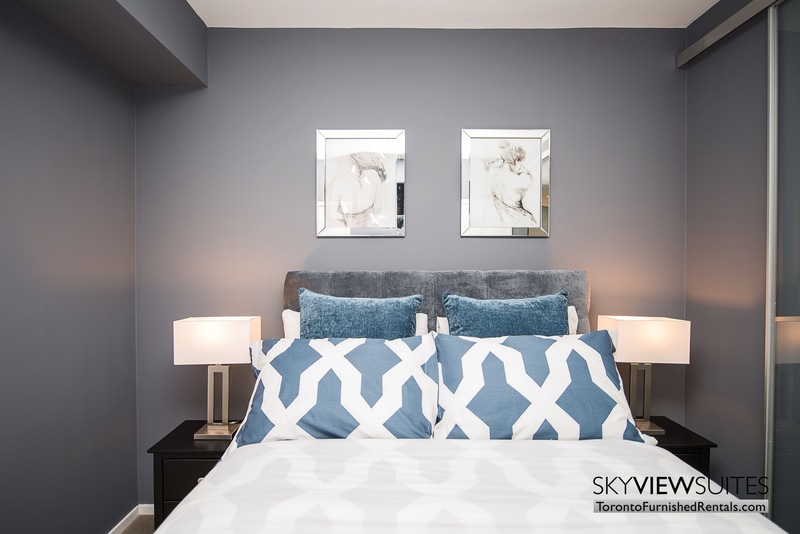 The suite features custom-designed Cecconi Simone (renowned Canadian design company) kitchen cabinetry and an innovative backsplash storage with fashionable glass shelves for a modern feel. Granite countertops are stylish and easy-care, so they will always look beautiful. The appliances are all contained in the kitchen, hidden in the cabinetry. Full sized appliances include: front load washer and dryer, dishwasher, fridge, microwave, induction stove top and oven. The kitchen comes fully stocked and even includes small appliances such as a Keurig K-cup coffee machine, blender and small food processor. 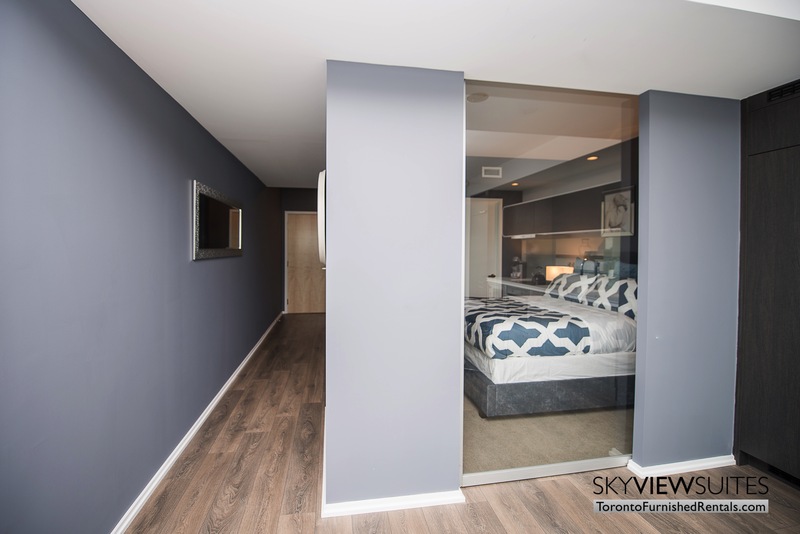 The living room and dining area are open to the kitchen and have comfortable and quality custom made furnishings – access to the balcony is in the living area. 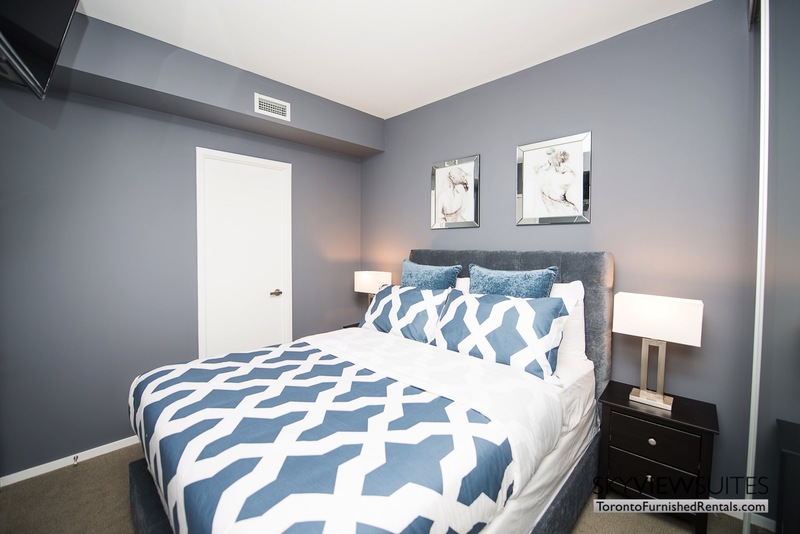 Included is a large flat screen TV and beautiful decorative finishes. The dining area seats 4 comfortably. The bedroom has a custom queen sized bed with pocket coil mattress. 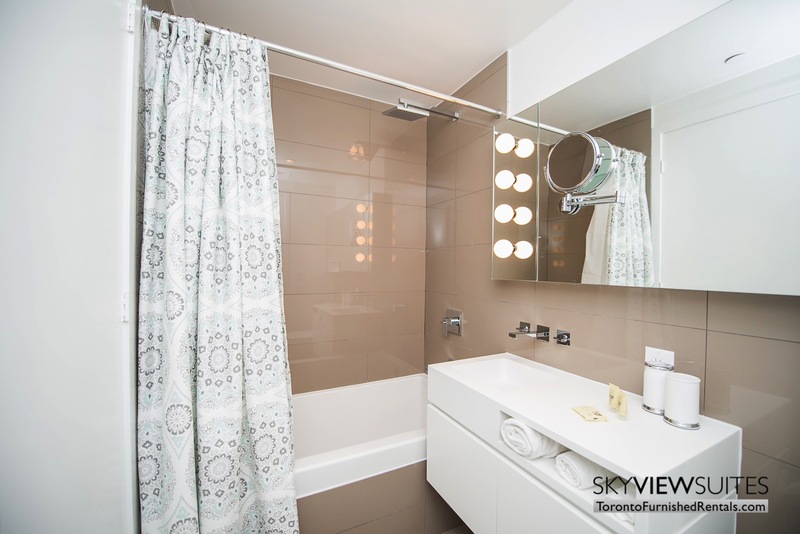 It also has direct access to the 4 piece bathroom with a tub and shower combination and gorgeous stone finishes. 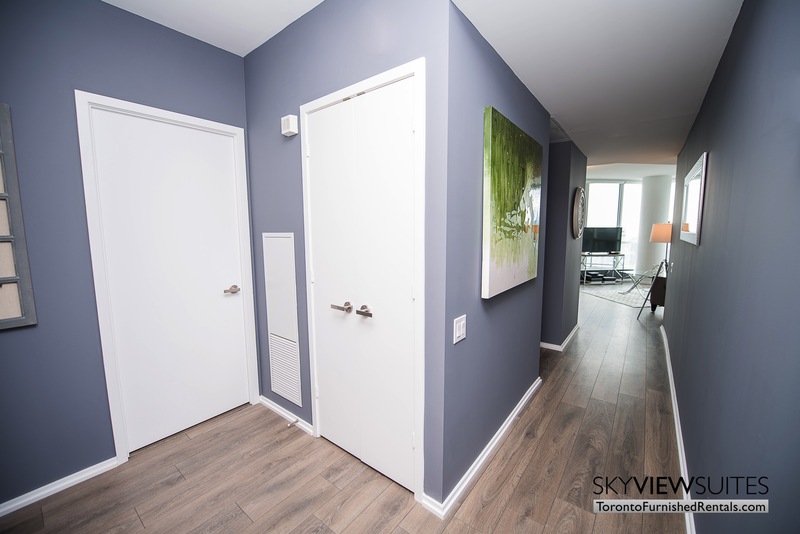 Another bathroom door allows access into the suite’s main hallway for convenient dual access bathroom entry. All linens and towels are provided. The den is perhaps the best feature in the suite. Fully enclosed, it acts as both a quiet and comfortable home office with a couch for reading, or it can be converted into an additional sleeping space, since the couch is a sleeper with a queen sized mattress. Whichever purpose this room serves, it’s a mini-oasis filled with rich colours and decor. 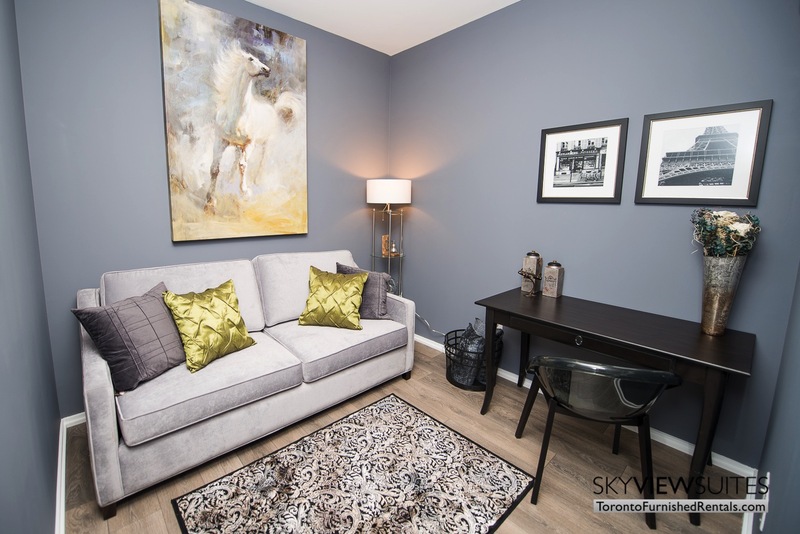 The price of the suite includes: unlimited high speed wireless internet, cable TV, unlimited local calls, all utilities, bi-weekly maid service for stays that are at least 2 months and one exclusive parking spot. 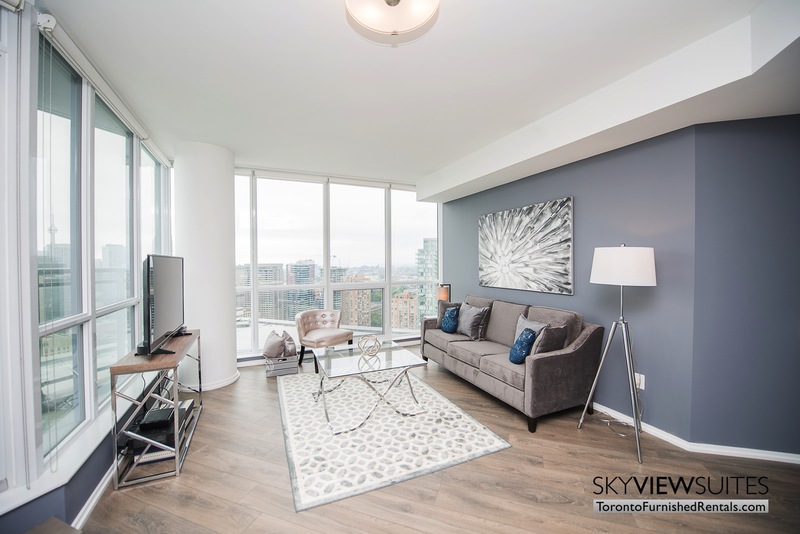 Steps from Toronto’s world-famous Yorkville neighbourhood is where you will find our furnished apartments for rent Toronto at Yorkville C. Enjoy the very best the neighbourhood has to offer all while being tucked away on Charles Street. Known for its high end shopping and dining, Yorkville is the epi-center of all things exclusive and fashionable in Toronto. Flanked by Mount Pleasant in the east and Avenue in the west, Yorkville is the first name in world class living. 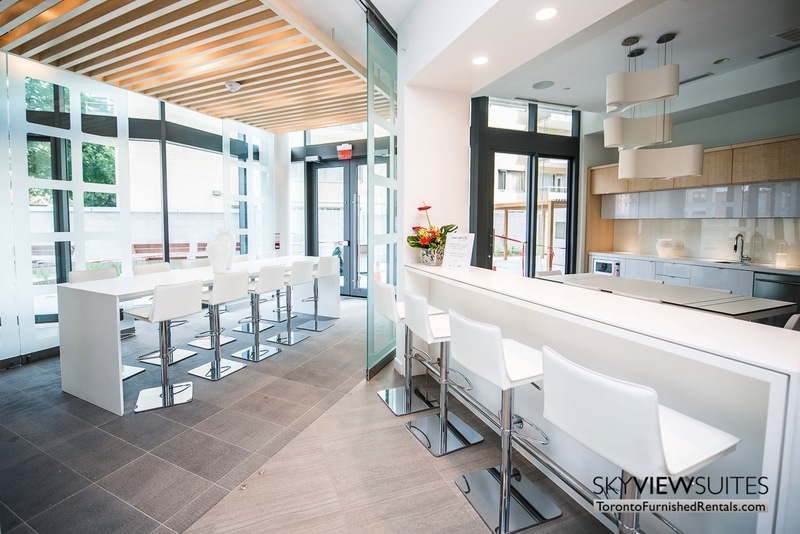 Our guests can enjoy living a mere minutes’ walk to some of the very best the neighbourhood has to offer such as The Cumberland Terrace, Hazelton Lanes, Bloor Street, and Yorkville Town Square Park, which boasts a 650-tonne stone carved out of the Canadian shield. 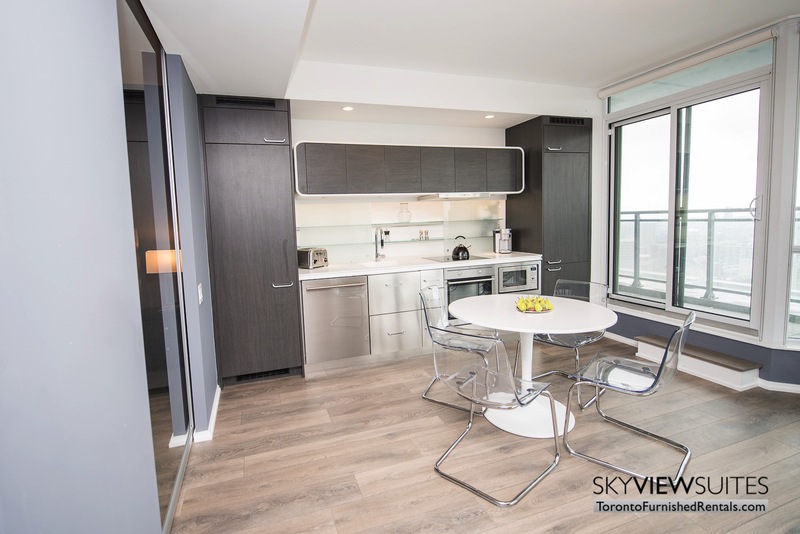 For the daily commute and getting around in general, our furnished apartments for rent at Yorkville C are a short 90 second walk to Bloor-Yonge subway station. From this interchange station guests of our Toronto short term rentals can access the financial district in a mere 10 minutes, the waterfront in 15, and nearly anywhere on the east-west line. Getting around on foot is a snap, since the suite boasts a perfect walk score of 100/100. This means that for all daily errands from groceries to banking or after work entertainment on the town, everything you could possibly need is just short walk away. Originally founded in 1830 by William Botsford Jarvis and local entrepreneur Joseph Bloor, the village of Yorkville began as a residential suburb to York (better known today as downtown Toronto). The area became recognized as a registered village in 1849, when the population reached 1,000 residents (compared to the estimated 22,000+ today). Fast forward to the 1960s where the area quickly became known as Canada’s capital of bohemian culture and the ‘hippie movement’. Today, the area is best known for its high end shopping, dining, and nearly endless parades of Lamborghinis, Maserati’s and Ferrari’s. This cultural shift occurred with the completion of the Bloor-Danforth subway line, which massively increased population density and accessibility in the area, thus driving up the real estate value. 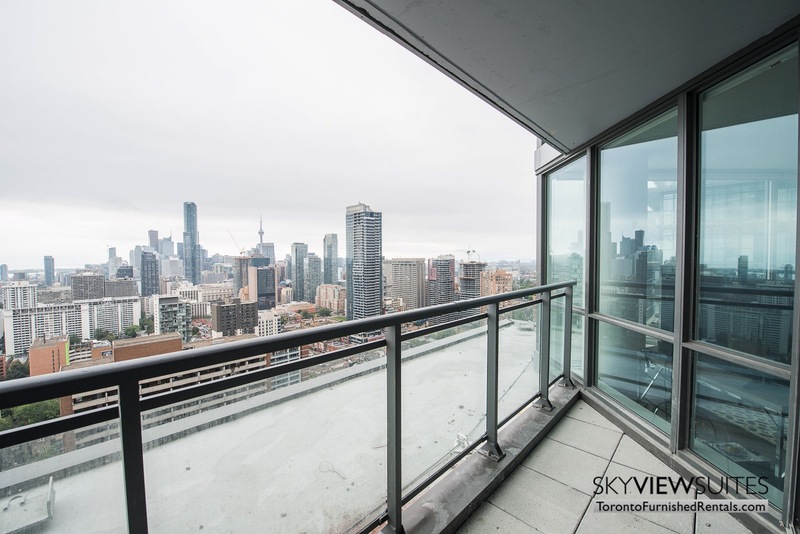 Sky View Suites is proud to help everyone looking for Toronto furnished condos find the unit that suits their needs and that includes finding the right condo building. will quickly note that integrated into the building’s design is the seamless unification of indoor and outdoor spaces, creating a sense that is at once private and social, with a look that is both modern and classic. The superb interior designers at Cecconi Simone have developed common areas that are inviting, attractive, and intelligent (for example, they can be easily re-arranged into more intimate or more social zones, depending on your needs and the nature of your event). A separate cocktail lounge spills out onto the expansive outdoor terrace. A sweeping staircase leads to the upper level, where a grandiose 20-guest dining room and demonstration kitchen is available for larger celebrations. 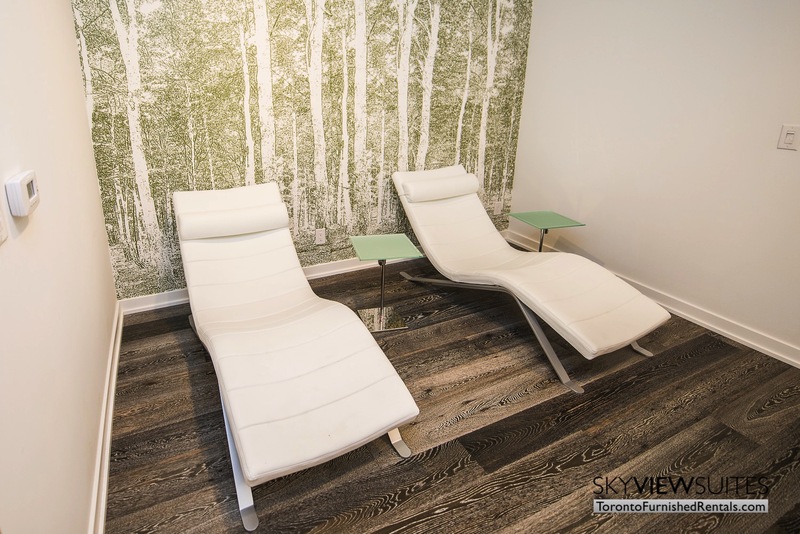 The practical yet beautiful amenities continue with the health & fitness center, including a state-of-the-art fitness studio, his & hers change rooms with showers and vanities, and steam rooms to help take the edge off of a long day. There is also a yoga / pilates studio is (reconfigurable for spin classes). With all of this at your fingertips, you can consider your gym membership a thing of the past! The building also boasts a 3D screening room with stepped movie theatre style seating and state-of-the-art audio and video, as well as a more casual, sports-oriented screening room with comfortable couches and a separate area where you can prepare snacks and drinks. Both theater rooms feature 4K resolution technology. The separate gamer’s area is a one-of-a-kind space with custom chairs, integrated audio and 4K resolution screens, including an 84-inch screen for those epic gaming sessions.